Minox are an established name in the miniature camera and scope market, having famously produced the “spy camera” 8 x 11 film cameras used by film-spies like Bond, and their real life counterparts during WWII and the cold war era – with a reputation for quality engineering and good optics (essential when shooting on such a small area), they expanded to produce the rather lovely Minox 35 in the 70s before 1995 saw them become part of Leica, and a new range of mass-market Chinese-made 35mm compacts joined the range of classic 8×11 models. Minox returned to independence in 2001 via management buyout, and now exist primarily making spotting scopes and miniature cameras for the collector market – including a range (produced with a Japanese firm) of 1/3rd (approx.) scale 8×11 reproductions of classic cameras like the Hasselblad SWC, Leica IIIf and Contax I. 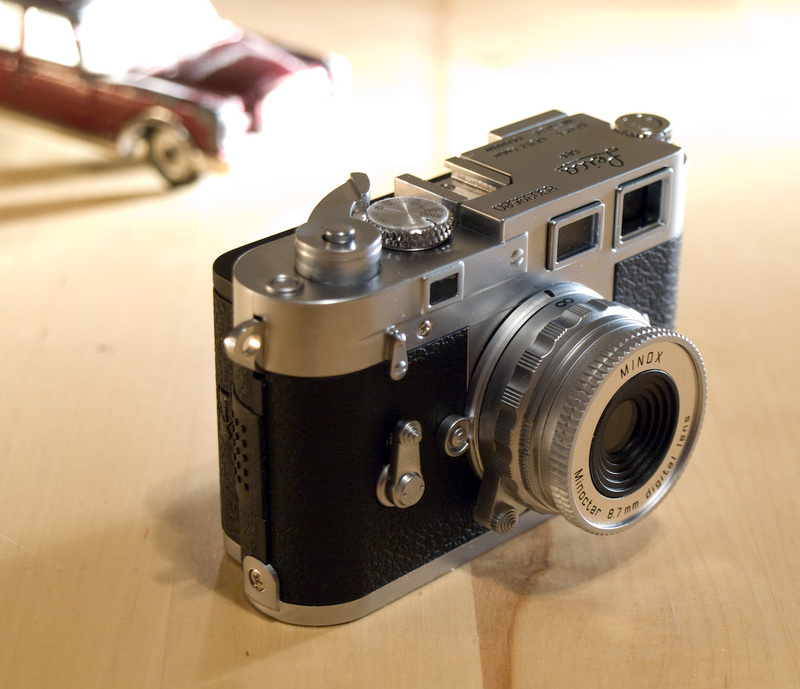 These cameras, made of metal and again offering decent performance, are very sought after by collectors, and were soon joined by a pair of digital models – the Leica M3 (4Mp) and RolleiFlex MiniDigi TLR replica. The latter model is unusual in that it goes so far as to mimic the 6×6 square format and top viewfinder via LCD inside the hood – being a Japanese product marketed by Rollei themselves in Japan, the new 5.0Mp (interpolated) version is now available from some online sources, but Minox have yet to release a version for Europe. Photokina 2006 saw the DCC M3 model updated to offer 5.0Mp interpolated (3.1Mp actual sensor size) and a rear colour LCD viewfinder, plus SD-card storage. With 32MB internal and up to 2GB on SD, the little Minox can store rather a lot of images, but crucially, what are the images like? 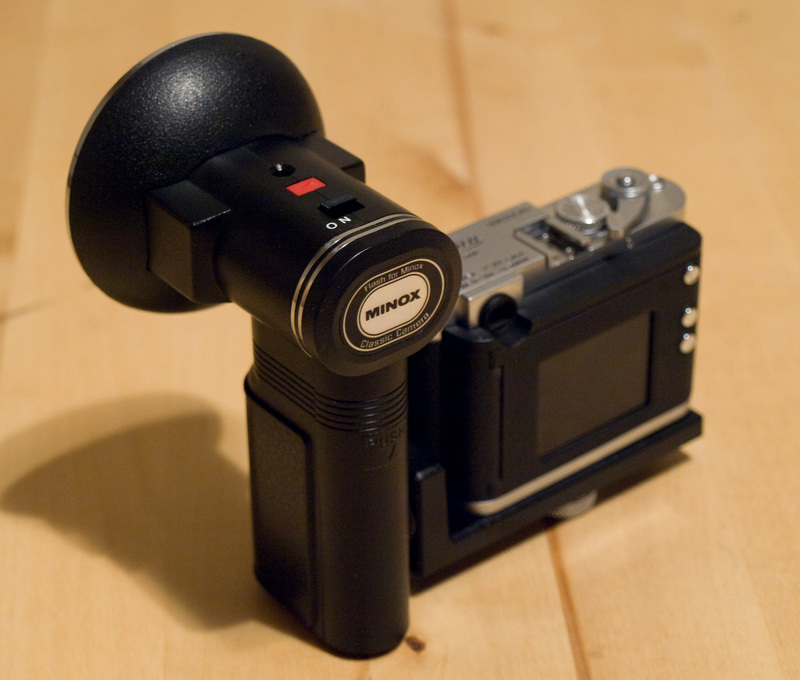 First of all, to give Minox credit, the DCC M3 is not being actively marketed as a serious digital camera. With a UK RRP of £219 it is already snapping at – if not already chewing – the heels of serious cameras like the Nikon P60 or Canon PowerShot G9, or even quirky models like the Ricoh digitals, and to add the flash official costs £89 making it somewhat of an expensive choice. It does, however, come in a wooden display box (not pictured as my review unit was in the German “airline” packaging of a metal tin with clear top) and you almost suspect Minox are thinking that people may never even take a picture with it. Despite the legacy of the Classic 8 x 11 range, the DCC M3 is not a partially metal-bodied replica, but almost entirely plastic and made in China – it has some metal “accents”, such as the non-functional dials and self-timer lever, and the hotshoe (again, non-functional – the flash connector is a proprietary two-contact affair on the base of the unit inherited from the Classic range). As a scale replica it pulls off looking like a Leica M3 reasonably well given that the film models also had the disruptive bulge on the rear, but this is not “highly skilled miniaturization” – for the hardware provided, it would have been perfectly feasible to make it an actual scale miniature – just look at a modern mobile phone. As a comparison, the depth of my Nokia N73 is within the dimensions of the top plate, and it incorporates a tolerable 3.2Mp camera, a large, bright and good quality LCD, a MicroSDHC slot… and a bluetooth equipped 3.5G handset.